We all know how profitable matched betting can be and many of us are making a considerable income from bookmaker free bets, bonuses and promotions. Unfortunately, there comes a time for some of us when we receive a dreaded email such as the one below which I received back in March from Bet365. The example above is a typical email you receive when you have been gubbed from a bookmaker. Gubbed is a term used by matched bettors when they have their betting accounts restricted. If you are gubbed by a bookmaker you may not be eligible to take part in any promotions such as free bets, price boosts, money-back offers etc or you may have your stakes restricted to the point that you are unable to place bets of any significant value. In the example above, I was both stake restricted and ineligible to participate in any promotions. It was not a good day! Especially since Bet365 were one of my favourite bookies and their Early Payout Offer was one of my favourite (and most profitable!) promotions. Unfortunately, there isn’t a lot you can do once you have been gubbed. Appealing will make little difference as it’s most likely that your account has been flagged for taking to much value away from the bookmaker through their promotions. Some matched bettors have reported ‘un-gubbings’ but these occurrences are rare and so if you have been gubbed, you can expect not to be able to use that particular account for any further matched betting purposes. However, all is not lost, as thanks to a promotion that a number of bookmakers have introduced relatively recently, there is a way you can profit from gubbed accounts! The ‘Lay To Lose’ guarantee is offered by various bookmakers and is a guarantee from them to lay the price they advertise for ALL customers. Put simply, any customer, whether they are gubbed, stake restricted or otherwise, can place bets on horse racing and win up to a specific amount. The majority of bookmakers who offer the Lay To Lose guarantee set the max win (profit) to £500 and so if you backed a horse to win at evens (2.0), your max stake would be £500, if the odds were 2/1 your max stake would be £250 and £100 at 5/1 etc. The Lay To Lose Guarantee has been introduced by various bookies after the Horse Racing Bettors Forum (ukhdf.org) addressed complaints from punters regarding restrictions imposed on accounts which had been winning. The Lay To Lose guarantee is usually only available on Class 1 and Class 2 races, although, BetVictor offer the guarantee on all UK & Irish racing in all classes. Various UK bookmakers now offer the Lay To Lose Guarantee and we expect more to follow in 2019. Some of the top bookmakers include BetVictor, SkyBet and Betfair Sportsbook which gives punters a reasonable choice of bookmakers to bet with on horse racing. The terms of each bookmaker vary but most will offer the guarantee from 10am on the day of eligible races and allow a stake which returns a max win of £500. It’s a good sign for punters that they are able to place bets, even on restricted accounts, but how do you profit from them? The Lay To Lose guarantee doesn’t mean that you are eligible to participate in promotions or receive free bets and so standard matched betting is not possible through the offer. One way punters have been profiting from the lay to lose guarantee is through arbitrage betting. Arbitrage betting, or ‘Arbing’ as it’s also known, is when you place a bet with the bookmaker and lay the same bet on a betting exchange and lock in a profit regardless of the result. This is only possible when the bookmaker back odds are greater than the lay odds on the exchange. You won’t be able to find arbing opportunities on every eligible race but you should only need to find 2-3 a day to return a considerable profit if betting max stakes. The aim is to wait until close to the start of the race and keep an eye on both the bookmakers back odds and exchange lay odds. If the lay odds start to drop then you may have found an arbing opportunity and you will need to act fast before the bookmaker readjusts their odds. It’s a good idea to have both the bookmaker and exchange websites open side by side. If you’re flicking between tabs, you’re losing time which you don’t have. The next race of the day is the 12:45 at Musslebrough. This isn’t a Class 1 or 2 race but I’m using BetVictor who offer the Lay To Lose Guarantee on all UK & Irish horse races. Above is a screenshot of the odds for the race which starts in 2-3 minutes time. Keeping an eye on Betfair Exchange, I notice that the odds on Glenora start to drop and so decide to place my back bet on BetVictor at odds of 8.0. The maximum I can win with the lay to lose guarantee is £500 and so my max stake is £62.50. I place this bet and recheck the Betfair Exchange odds. The odds continued to drop and I place my lay bet at odds of 5.7. 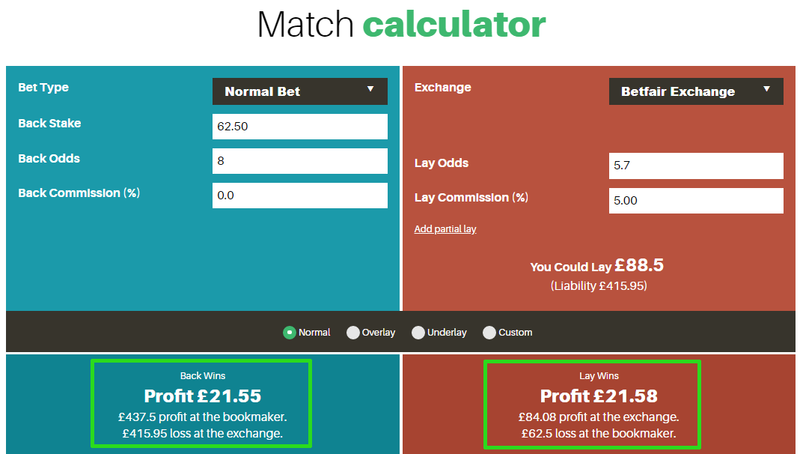 To calculate the ideal lay stakes you can use a matched betting calculator. When laying an arb, you have two options. Let’s take a look at the standard lay option. 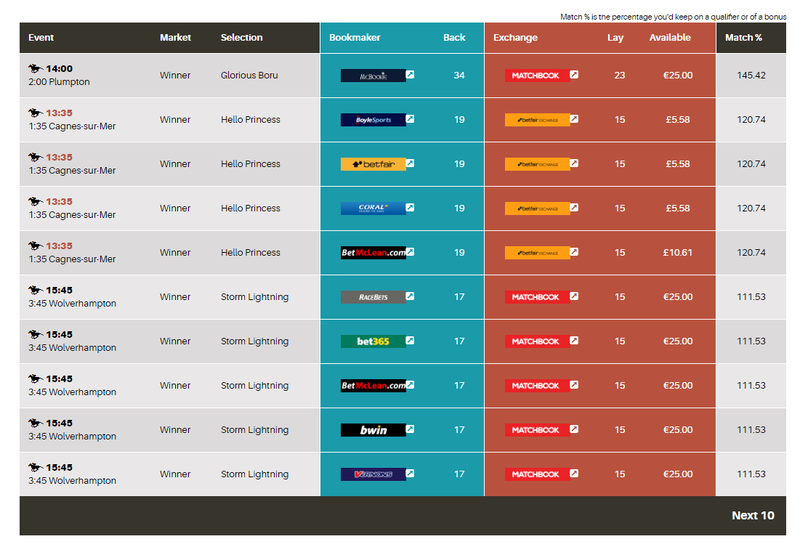 As you can see from the image above, if we placed a lay stake of £88.50 on our horse, we would make a profit of £21.55 if it won and a profit of £21.58 if it didn’t. Pretty good for 2 minutes work! Now let’s take a look at the underlay option. If we underlay our bet, we only place a lay stake of £65.79 on our horse which would return a profit of £128.29 if it wins and we would break even if doesn’t. To Underlay or not to Underlay? Your choice whether to underlay or not is entirely up to you. On average, you should make the same profit over time but you may consider underlaying if the profit with the standard lay is relatively small. If you are able to hit just 1 winner a day underlaying, then you could make considerable profits over time but you can lock in a profit every time using the standard lay method which is also desirable. If you’re available 5 minutes before the start of the race, you can simply monitor the bookmakers odds and exchange odds in separate windows. However, you can also find arbing opportunities at an earlier time and the easiest way to do this is by using an OddsMatcher. The OddsMatcher tool at ProfitSquad updates in real-time, meaning that you’ll see the odds as they are at any point on the bookmaker or exchange websites. There’s no need to refresh the page as the odds will update automatically. By default, the OddsMatcher will not display arbs. This is because arbing is not generally recommended for matched bettors as the bookmakers don’t like it and it is not a good way to preserve your accounts. However, if you’re using a gubbed or restricted account, it really doesn’t matter. To set theProfitSquad OddsMatcher to display arbs, simply increase the maximum rating to above 100 using the filter. This will then include arbs in the OddsMatcher as shown below. As you can see, there are numerous arbing opportunies at various bookmakers where the back odds are greater than the lay odds. Anything with a rating of above 100% is a profitable arb. 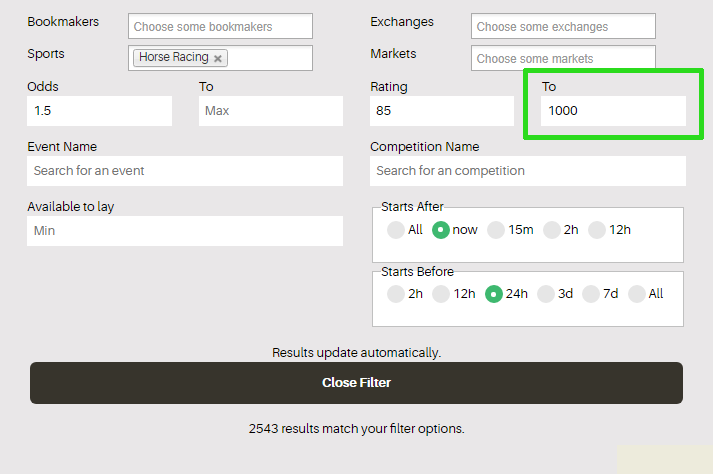 You can then use the filter again to display only arbs from specific bookmakers or in specific races. As mentioned, BetVictor offer the Lay To Lose guarantee across all UK & Irish racing but some bookmakers such as SkyBet only offer it on Class 1 and Class 2 races. These are not always easy to find on SkyBet and other bookmakers and so the easiest way to find eligible races is to use a site such as SportingLife.com. 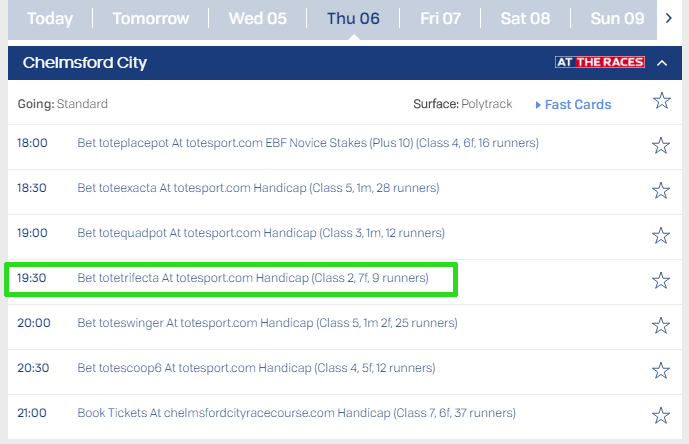 By visiting SportingLife.com, you can navigate to the ‘Racecards’ section which will display a list of races at meetings for the day and future days. Next to each race it displays the class and so you are easily able to find Class 1 & 2 races for the day. This isn’t a guaranteed profit strategy. The main risk is that you place your bookmaker bet and the exchange lay odds increase and the arbing opportunity has gone before you have the chance to place your lay bet. This means that you may have to lay the bet at a higher price and take a small loss on occasion. However, if you’re smart with your bets, you should be able to make more with the arbing opportunities you do get on than the losses you make on the ones you don’t. The more you do this strategy, the better you’ll become at noticing how the odds fluctuate and you will be able to take advantage of arbs more often and more successfully. This is a pretty straightforward strategy but there are some tips which may help you earn maximum profits. Monitor the back and lay odds close to the start of the race. 5-10 minutes should be enough time. The odds may jump around during this perios as punters get their last minute bets on which opens the door for arbing opportunities. Be prepared. You have to be quick to take advantage of arbing opportunities as they don’t last for very long. Either the lay odds will drift or the bookmaker will shorten their back odds. Be prepared by having both the bookmaker and exchange websites open at the same time. Pre-fund your accounts. You won’t have time to be making deposits when an arbing opportunity arises as it will most likely be gone by the time you navigate back to the market. Make sure both your bookmaker and exchange accounts are funded adequately so that you can place your bets with the click of a button. Don’t use healthy accounts. This strategy is mainly for gubbed or restricted accounts. You should be able to make money from free bets, refund offers and other promotions if your account isn’t restricted and so there is no need to risk those accounts with this strategy. Trial the strategy first. It is a good idea to test drive this method without placing any bets before playing with real money. Monitor the odds, find some arbing opportunities and calculate your lay stakes to see how profitable it can be. When you’re comfortable with how to find opportunities and how quick you must be in placing your bets, then start with low stakes before moving up to the maximum allowed. This is a great way for anyone to make money from accounts which have previously been restricted or gubbed. The Lay To Lose guarantee is available to everyone and with a generous guarantee to win up to £500, there is a lot of potential to make profits on a daily basis. There’s no reason why you can’t use this method alongside standard matched betting or casino offers to increase your profits further but we only recommend you do this on restricted bookmaker accounts.